A sandwich experience like no other. The loss of Scratch Bakers to City Works Depot was mourned by the masses - us included - until word came that the team behind Scratch and Three Beans Coffee Roasters, Jonny McKessar and Steve Vanderput, were opening a new eatery in its place. If, like myself, you know a craving for the Scratch pork belly apple cider pie will hit before the week is up, never fear - a range of their much loved cabinet food is available at Three Beans two doors down. 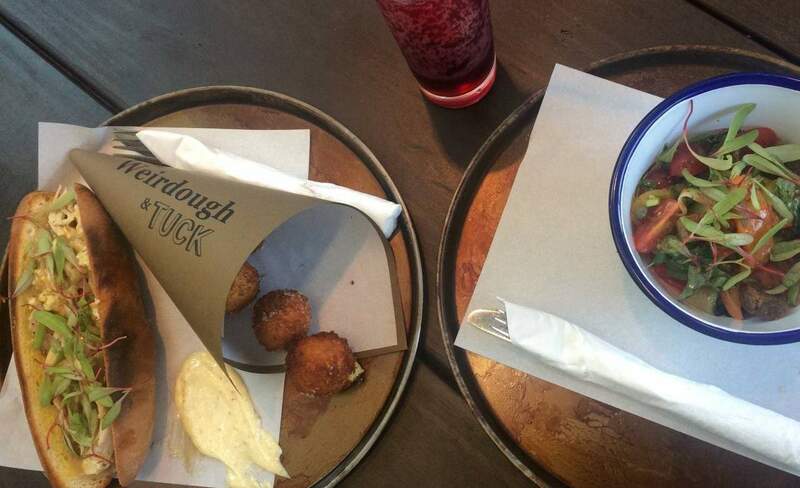 Weirdough & Tuck is the eatery we're talking about. Although small, the new 'tuck shop style sandwich bar' is quickly making a big name for itself. The fit-out is in the easy, breezy style that's spreading across the City Works precinct, with an industrial interior and concrete slab outdoor tables that you can perch at with a pint from Brothers Beer for a 'working lunch'. The food menu is organised into long rolls, brioche buns, jaffles, salads and sides, and is full of unusual combinations and sandwich fillers you don't come by every day; the pan-fried sweetbreads brioche bun and fried soft shell crab long roll definitely caught our eye. Highlights for us were the brioche bun, stuffed with Sichuan fried chicken, ginger, carrot, coriander and chilli jam ($10), and the salad of heirloom tomatoes, capers, white anchovies and paleo croutons ($6 for a small) - one of three on offer. Whilst not the ideal meal for pre-summer bikini-ready bodies, the jaffle of duck fat potatoes, black truffle, mozzarella and cheddar ($7.50) although in need of a bit more seasoning, are totally indulgent. The sodas are fantastic on a hot day, though if you don't have a huge sweet tooth, go for the beetroot and burnt orange ($5), it's an unusual but delicious, almost savoury thirst quencher that you're bound not to get elsewhere. The hand cut fries ($5) were good, although the sherry vinegar salt was tough to pick up on. The other side dish though, oh my. Don't even think about leaving without trying the gruyere tater tots ($6). Those warm, crunchy, cheesy and potato-y balls of goodness along with their garlic aioli will leave you absolutely smitten. With their sunny outdoor area, adventurous menu and partnership with nearby beverage joints, Weirdough & Tuck fits right in to the ever-evolving City Works Depot. Just be warned – you’ll never feel the same about your usual ham and cheese on wholegrain after one of Weirdough & Tuck’s creations. We wish someone had told us that.